Z-flex (half of Z purlin), L purlins- Used for frame construction, insulation and decoration materials to the walls of the mineral claim. Frameworks of these profiles are used and renovated buildings facades. s, mm h, mm b, mm mat. 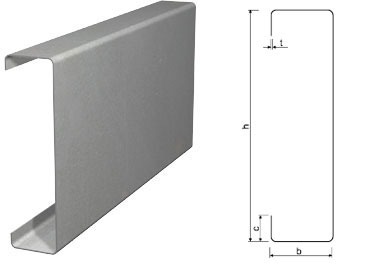 Used for cladding metal cartridges contention ventilated façade, in between the insulation and finish need to leave an air gap for ventilation. T purlins supplied by mounting angles with holders (MK / L) is placed in the wall cladding material with ceramic tiles or minerals plate.